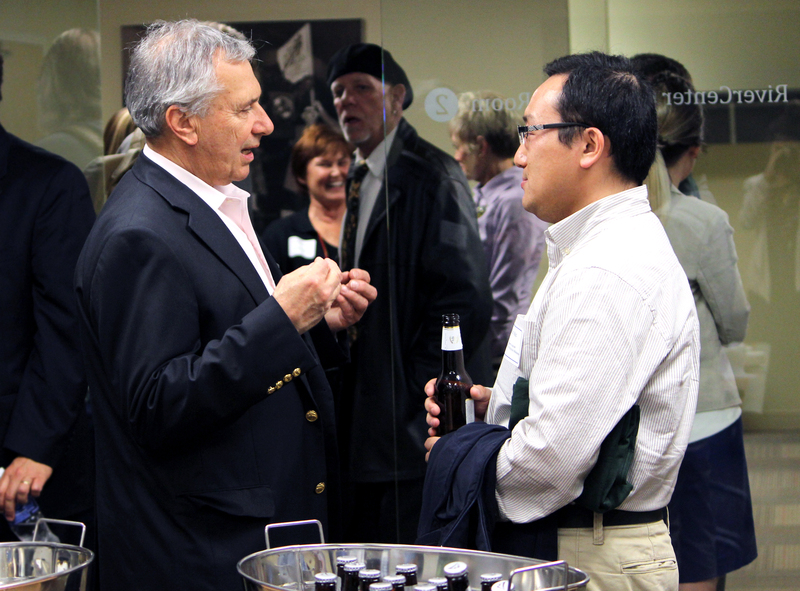 May 6 marked the second Quarterly Member Meeting of 2015! Thank you to our hosts the Milwaukee Bucks for the accommodation and to Bango for aiding in a very engaging Water Council member meeting. After nine years of red and green, the team colors of the Milwaukee Bucks have taken a turn to reflect the state they come from. Ted Loehrke and Marc Malterer of the Milwaukee Bucks gave Water Council Members an inside look at their new logo and its rich meaning. New colors: Cream City Cream, Great Lakes Blue and Good Land Green represent more than a surface glance of Wisconsin, they pull from the landscape, architecture and history of the state. Good Land Green is a hallmark of the Bucks brand and symbolic of the state’s dense forests and rich agricultural industry. The cream mirrors the Cream City brick original to Milwaukee Architecture. Last, and most exciting to The Water Council and its members, is Great Lakes Blue. Reserved for use in the third logo, a rendering of Wisconsin, it defines where water borders the state and has been forecasted as a potential home game jersey color. The incorporation of blue underlies the importance of 15K inland lakes, 84k river miles and the Great Lakes which have helped define Wisconsin and Milwaukee’s industrial history and are now propelling a new economy forward. The integration of Great Lakes Blue is further testament to Milwaukee’s emerging water-driven industry. South Korea, a country long overshadowed by bustling China and Japan, is now looking at accelerating its own economy by adding their name to the list of global water clusters. After the Ministry of Environment budgeted $330 Million (USD), South Korea began a global search for the best example of what they would like to accomplish, alas discovering The Water Council and the Wisconsin water cluster. They called upon Julia Taylor, President of the Greater Milwaukee Committee & Water Council Board Member, Preston Cole, Deputy Commissioner of the Department for Public Works for the City of Milwaukee, and Dr. Woo-Jin Chang, Assistant Professor of Mechanical Engineering at UW-Milwaukee, to provide insight into ‘the secret sauce’ that makes the Wisconsin water cluster truly great. Taylor, Cole, and Dr. Chang discussed the success of public/private partnerships within the Global Water Center and southeast Wisconsin, and the potential for Water Council members to expand into South Korea’s opening market. Already, over 200 water companies from around the world have agreed to set up offices in Daegu City, South Korea and kick-start their cluster. With a well-funded, middle-class market, the benefits come not only from what lies inside their borders, but also from the surrounding Chinese, Japanese, and Russian Markets, creating an enticing prospect for companies looking to expand into the Korean market. Water Summit 2015 is just over a month away! Delegates will be flying in from across the world to expand on this year’s theme “One Water.” Dean Amhaus, The Water Council President & CEO, debriefed on “One Water,” a topic that will soon move from an idea in the periphery to a necessary movement in propelling the water industry forward. The key focus of this topic removes the notion of dividing storm water, wastewater, and energy utilities into separate silos, but rather how they should move to an integrated support system. As the time urgently approaches for U.S infrastructure to be replaced, now is the time to be thinking about a “One Water Region” and putting this concept into action. Join us at Water Summit 2015 to elevate your business! New this year, attendees can easily connect and schedule meetings ahead of time with ‘Meeting Mojo’ an online scheduling software set to launch in the coming weeks. As The Water Council pushes forward with a new website, the integration of a Water Network Map takes center stage! The Network Map will be a useful resource that promotes Water Council Members with a business profile to visitors around the world, while also showcasing the vast reach of our Member network. How can members engage? Each primary contact has the opportunity to fill out a survey providing current information that The Water Council can use to visually show the strength of the Wisconsin water cluster. Stay tuned for more information on the new website due to launch this fall! To participate in the survey, and ensure your company is represented in the Network Map, contact Isaiah Perez, Member Services & Development Coordinator, at iperez@thewatercouncil.com. Center of Excellence- Opportunities to Grow and Expand Your Small Business! In May The Water Council’s Center of Excellence for Small Business will host two workshops, the first focused on Lean Customer Development with esteemed author Cindy Alvarez on May 21, and later a webinar highlighting water technology opportunities with the Department of Defense. In the summer months, ExporTech for Water Tech, a three month export focused seminar, presents a unique scale-up opportunity for small and medium sized businesses. Roxanne Baumann of the Wisconsin Manufacturing Extension Partnership (WMEP) discussed how in the past 10 years, Southeastern Wisconsin experienced a 6% decline in domestic sales but a 6% growth in exports, suggesting the success of these companies depends on finding new markets outside of the U.S. After taking the ExporTech seminar, graduates have achieved sales increases averaging $900,000 in 6-9 months after completion. Further details on ExporTech can be found here. Interested in signing up for the program? Contact Karen Frost, Small Business Program Manager, at kfrost@thewatercouncil.com. 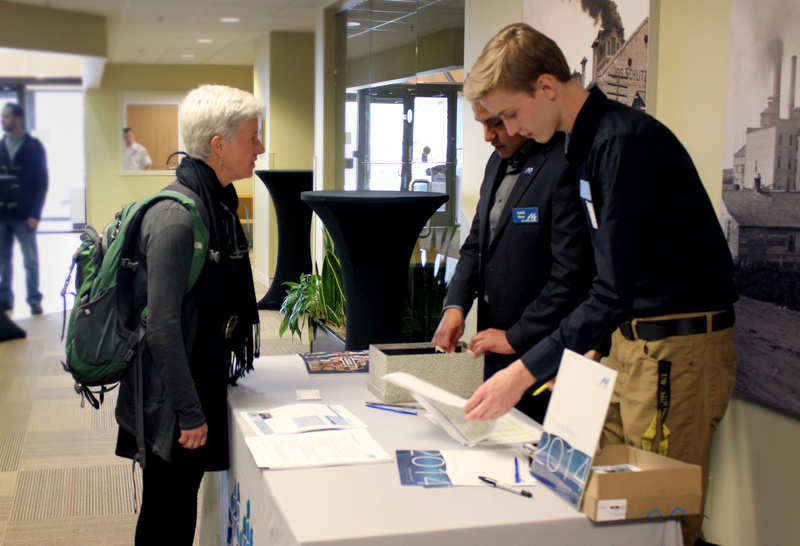 The Water Council’s Talent and Education Committee has made many advances in the past few months by reaching out to youth and connecting them with water industry leaders. This year their primary focus will be on connecting students with internship opportunities. Internships offer low overhead with high reward for companies looking to bring on new talent. Looking to bring an intern onto your team? Contact Elizabeth Thelen Tap into the monthly Tide newsletter for more opportunities to engage. BREW Batch 2 winners have exceeded expectations over the closing months of the accelerator program’s second year. Cadens LLC, a hydro-technology company, received a Small Business Innovation Research (SBIR) Grant for their work, and first BREW winner to receive such an award. Pellucid Water, another BREW Batch 2 startup, has advanced into the final 12 companies competing in the WI Governor’s Business Plan Contest. BREW resources expand as UW-Madison Law Clinic will host office hours at the Global Water Center, utilizing grad students to aid in legal services, consulting, and market need assessments. The next round of cutting edge water technology startups will be unleashed within the Global Water Center when BREW Batch 3 winners are announced during Water Summit 2015! 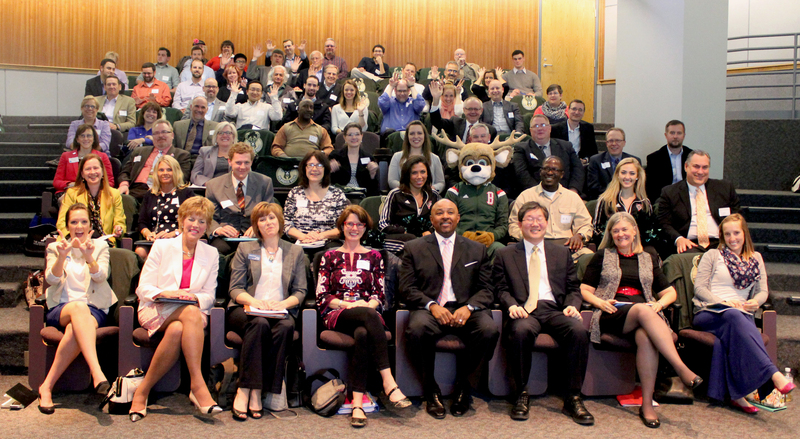 A huge thank you to the Milwaukee Bucks for hosting a great Quarterly Meeting! Save the date for our Q3 Member Meeting hosted by ABB on Wednesday, September 9th, more details to come!